For some time, we have been lead to believe that cooking with lard is bad for us and unhealthy. While this might be true about the processed, commercial lard found in today's supermarkets, the fact that homemade rendered lard prepared from natural, pastured pork is a healthy fat and excellent for many baking, frying, and other cooking purposes. Indeed, pastured pork produces lard that has many of the same health benefits as olive oil - and is unsurpassed in certain recipes for producing light, flaky pastries and tasty, non-greasy fried foods. If you have a source for high-quality pork fat from well-raised, pastured pigs, then you should learn how simple it is to start making lard and begin using it in your home-cooking and recipes. 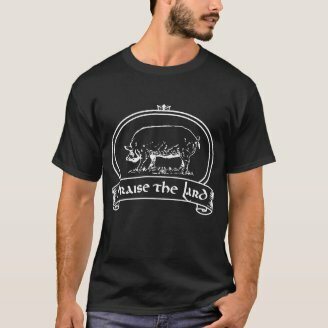 On this page I will show you step-by-step how to easily prepare lard at home, talk in more detail about why lard is in fact good for you and your food, and also about how to find the right sources for lard near you if you are not currently raising your own pigs - and truthfully, how many of you are? Probably not many, but I'll bet you can find a source near you. The secret to quality, healthy lard is starting with quality, healthy pork fat. Pastured pork means pigs which are allowed to live outside and enjoy the sunshine and natural environment as much as possible. When pigs are raised in such conditions, their fat becomes high in Vitamin D (thanks to all of that sunshine) and is an excellent source of healthy monosaturated fats - much like olive oil! This is why home-rendered lard from pastured pork is so good for you - and so different from the commercial lard you may find for sale in the supermarket. Most supermarket lard is hydrogenated to "improve shelf life" - which has health implications as hydrogenated fats have been linked with heart disease. You also don't know the source of the pork fat used in most commercial lard, and it is likely from pigs raised in high-volume factory farms where the pigs may have never seen natural sunlight once in their lifetimes! Lard is wonderful in many uses in cooking. Pastry chefs know nothing makes for flakier, tastier pie crusts than lard. Lard is outstanding for any kind of frying because of its high smoke point - you'll make the crispiest, most moistest chicken, fried fish and french fries when you use lard. I also love lard when frying tortilla chips (they cook so fast there's very little grease and oil on the chips). It's also great when cooking any kind of pork roast or making a stew with ground or cubed pork meat. How I became a "lard-lover"
My mother began raising pastured pork several years ago. In the Fall of 2011 we had our first pig butchered for our own use (instead of sending to market). This pig was nearly 400 pounds in weight - and about 100 pounds of that was pure fat! We weren't sure what to do with all of the fat at first but I am a strong proponent of Nose to Tail cooking and eating - if an animal has given its life for our nourishment, I believe we should honor that animal by utilizing as much of its body and meat as possible. I read about preparing lard and other uses for pork fat, and thus began experimenting with preparing lard at home. Since then I have become an avid lard user and proponent. I prepare lard as I need it from 5-pound blocks of our pastured pork fat, for my own use as well as to gift to friends curious about cooking with lard. If you are interested in preparing lard yourself, talk to your local butchers and farmers, particularly at farm markets where natural, pastured pork is available. You can also search on-line for "pastured pork" and find numerous farms selling directly to customers, either on-line or at their farm. I'm sure once you start cooking with quality lard, you'll never want to stop! Leaf Lard comes from the finest quality soft-fat around the kidneys and loin of the pig. It may be harder to track down, but has the cleanest flavor and is the best for baking purposes. This is the method I've used repeatedly with great success to render my own lard. You'll also end up with delicious "cracklings" from leftover solids. These are great to munch on as a snack, to top off bowls of chili, or even as salad toppings! Very carefully trim the pork fat to remove any remaining meat and/or blood spots. You want the fat to be as pure as possible to render the whitest, most shelf-stable lard. Cut the fat into small cubes, about 1/2-inch in size. Place the cubed fat in a heavy-bottomed stock pot. Add a small amount of water to the pot, no more than 1-2 tablespoons. Place the pot on the stove and begin to cook slowly, at the lowest heat setting possible. Stir the fat frequently at first to avoid any of it sticking to the bottom of the pot. As the fat begins to turn translucent and "sweat", continue to stir every so often, although it does not require constant monitoring. Continue cooking over very low heat as the fat liquifies. Solids will eventually float up to the top, the last remnants of the fat which will not liquify. Once all solids have floated to the top and are just starting to turn brown, turn off heat. Place a strainer draped with cheesecloth over a clean bowl. Slowly pour the lard over the cheesecloth and in to the bowl, straining off all solids. Pour the lard into storage jars or other containers and allow to cool to room temperature. Once completely cooled, the lard with re-solidify and should be white/off-white in color. It's ready to use and enjoy in your cooking! Here's a large block of pork fat. Trimmed fat in the pot. Ready to start cooking. It doesn't take long at low heat for the fat to begin to turn translucent. Some of the solids are turning brown as more of the fat liquifies. The solids are all floating to the top and turning brown. The lard is poured over a cheesecloth in a strainer to collect the solids. The lard is poured over a cheesecloth. I use canning jars for storage. After cooling, the lard solidifies and is ready for use. 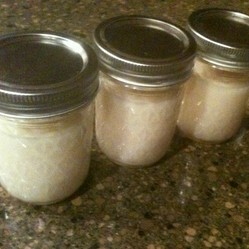 Properly rendered lard should last indefinitely, even at room temperature. You may feel more comfortable keeping your lard in the fridge for consistent temperature storage, or in the freezer if you've rendered a large quantity at once. Lard that has gone rancid will smell unpleasant and should be thrown out. These videos will take you through the process of rendering lard in different ways. Everyone has their own technique! Detailed discussion of preparing your own lard (and why you should). Preparing lard in the oven. Discussion of making lard at the Nourished Kitchen website. 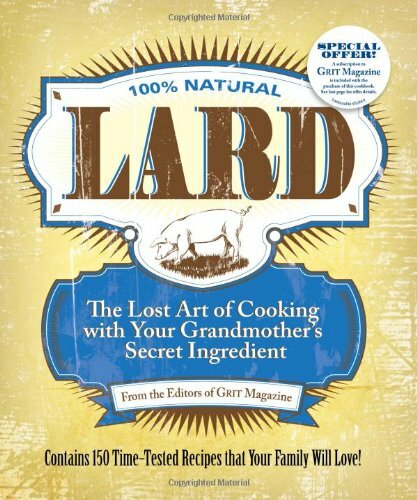 Do you cook with lard? Absolutely! I regularly use lard in cooking and baking. I use lard frequently but only if I've prepared it myself or know it comes from quality pastured pork. I used to cook with lard but I've become cautious about doing so for health/diet reasons. Lard? Yuck! Isn't that stuff gross and fattening? 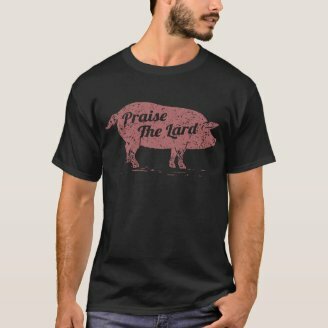 Are You a Lard Lover? 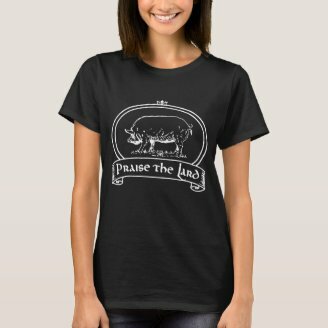 Then show it off with some fun lard gear! I agree with you about nose to tail cooking, for wasting any part of the animal is not right; and what you say about pastured pork makes sense. The danger is in the dose. If we eat too much of anything, including lard, it will harm us, but as long as you are sensible and eat the right portions of various materials we will gain much benefit. Lard. I always have lard in the fridge. Here in the North of England independent butchers often sell it in their shops and I had wondered why it is so superior to the grocery store stuff. I think the secret is to use it in moderation. For dishes such as proper Yorkshire Pudding ( Oh my word , my favourite ! ) or English fish and chips, lard is the only thing I will use. I also use it in pastry using my mum's method. Lard does make food taste better but as my butcher provides it I buy it from him. A very good article Sockii and well disussed. TY. It's definitely worth making your own if you have a source for good quality pork fat. I've been using lard for years but I never made it myself. After reading your article I might try!